Mercedes-Benz Cars Middle East and Levant has announced the major regional milestone of over 15,000 sales for the latest generation E-Class since its 2009 Middle East launch. Currently on track for a record year, 2012 sales are up 19 per cent on 2011, the company said in a statement. Lead by the V6 engine E 300 sedan - representing 54 per cent of all sales since 2009 - E-Class enjoys wide appeal due to its availability in sedan, coupé or cabriolet variants, it added. With the E-Class Sedan seen as the definitive Mercedes-Benz, it therefore goes without saying that the brand values of comfort, safety and reliability have all been ingrained into the core of the current W212 model series. Around a dozen different assistance systems are available to customers, including the standard-fitted Attention Assist system, which monitors more than 70 parameters to determine a driver’s level of concentration, enabling it to warn the motorist in time if he or she is suffering from fatigue. The E-Class also scores well among customers when it comes to value: It was declared the “2011 Value Champion” as a result of an assessment carried out by Auto Bild magazine and EurotaxSchwacke. According to the residual value forecasts of the market researchers, a four-year-old E-Class vehicle will have the lowest loss of value in the upper-range segment. 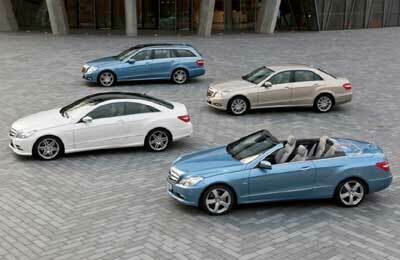 The E-Class also consistently ranks at the top of driver satisfaction surveys, most recently the J.D. Power 2012 Vehicle Ownership Satisfaction Study (VOSS) - leaving all other competitors in its wake when it came to customer satisfaction in the Executive Luxury Car category. The E-Class Coupé is the most sought-after coupé in the executive car segment, the company statement said. The E-Class Coupé was built in the tradition of sporty and exclusive Mercedes-Benz executive coupés.